September 1st, I joined the gals at No Place Like Home Again, a shop with antiques, collectibles, home decor, antique furniture, up-cycled and re-purposed furniture and decor items, new items, garden junk, jewelry, and ladies' wear. Like I said in the title to this post, there is something for everyone! I hope to update you from time to time with unique items added at the shop. Today I am going to share some photos of some of the other partners' rooms. The first room belongs to Chris. Chris is a fabulous decorator and furniture painter. This sweet little desk painted in grays, and black with a whitewashed top has stenciled fleur de lis in the corners. The matching chair has a fun fabric seat and is the perfect compliment to the desk. I love this dining set. Chris painted the legs and left the top with it's vintage wood patina. This set would be perfect in a French country kitchen. The painted humidor at the left of the photo is painted in a shabby chic style. Here is a fun repurpose of an old Victrola. A super unique and stylish piece in black. Lovely lines on this chest by Chris. If you love blues, this chest with a dark stained top, has some interesting detail. The next room is Betty's. Betty owns a log home on the lake and sells some awesome lodge and up north style antiques and decor. Wool blankets, crockery, miniature log houses, and vintage tins fill this shelving unit. Betty's room's newest furniture piece is this farmhouse/shabby chic style white hutch. Many of Betty's furniture pieces include French stencils. Betty's vintage photos and cards are cleverly displayed on a old crib spring. More of Betty's room, with oil lamps, more miniature log homes and wall decor. 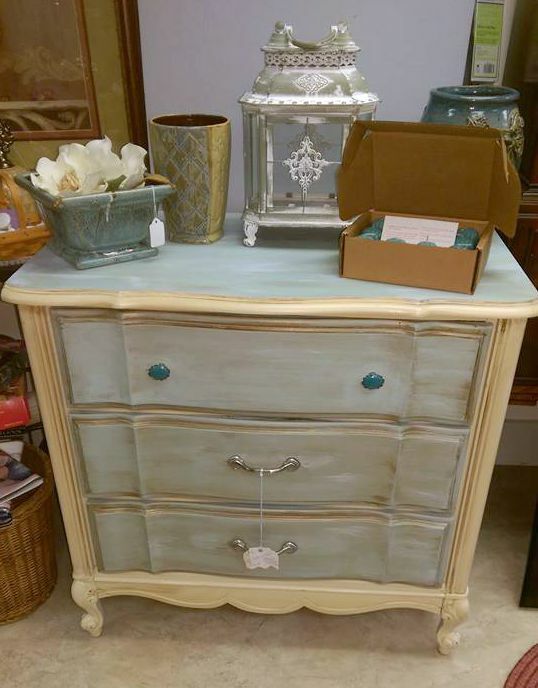 Partner Trina paints and builds rustic furniture too. Here are a couple of new gray pieces in Trina's room. This lovely antique armoire is in it's original, crackled finish. Besides furniture, you will find vintage kitchen utensils, vintage tools, vintage hunting, fishing and camping collectibles too. Great garden junk too! New pieces from Trina, just in! This cute little black chest in Trina's room has wine cork knobs! Then there's my Junkin' Friend Jodi's room. Jodi is a furniture painter, big time sign painter, and always has the greatest old junk in her room . Here is a red dining table with curved legs, and vintage yellow chairs in Jodi's room today. 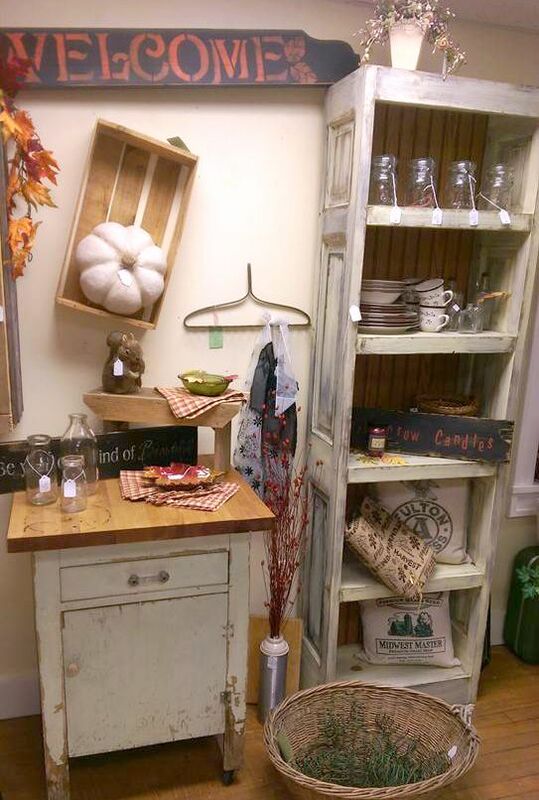 Jodi just brought this Hoosier cabinet into the shop, and hasn't staged it yet, but it is a very fun piece. This large oak display cupboard is in one of Jodi's rooms. 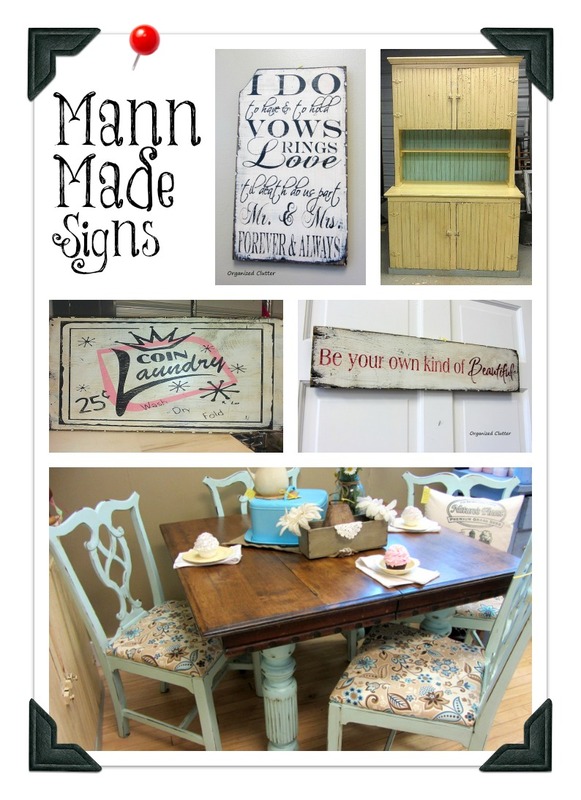 I have a whole blog post here with many more of Jodi's projects! When I stopped at the shop today to take photos, partner Clarice was busy fluffing her new space for fall. Clarice sells antiques, collectibles, some new merchandise, including home decor items and jewelry, furniture, and lots of seasonal decor. Clarice definitely got the place ready for the fall buying season! My room is still a work in progress. I sell my up-cycled and re-purposed garage sale items, antiques, collectibles, and seasonal decor, with small small furniture pieces. I'm still waiting for these junk Jack o'Lanterns to find a new home! This toolbox with fall paint by number cut to fit the inside cover was one of my favorite fall decorations.Real mini pumpkins and gourds aren't available as yet, so I have faux Dollar Tree pumpkins in there for now. See it with the real thing here. I am so happy to be a part of this interesting and fun place to sell and shop! Looks like a great shop and a lot of fun to be a part of! I'm sure in no time your artwork will be flying off the shelves of your booth!!! What a fun shop, I'd be filling up a truck load if I lived closer.